Monongalia County Commission votes unanimously to purchase ES&S ExpressVote units, DS200 tabulators and ExpressPoll tablets for the 2016 election cycle, making it the first in the state to utilize this voting system configuration. 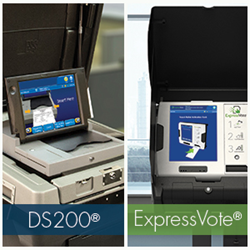 Monongalia voters will experience visionary voting firsthand on Election Day with the DS200 and ExpressVote. I think the ExpressVote technology combines the best of what we as election officials want to see in election equipment; the ballot printed and given back for the voter to verify and the efficiency and express tabulation we look for on Election Night. On July 2, 2015, Monongalia County became the first county in West Virginia to purchase Election Systems & Software (ES&S) ExpressVote® Universal Voting Systems and DS200® in-precinct vote scanners and tabulators. They plan to have all registered voters use ExpressVote units to mark their ballots, subsequently feeding them into a DS200 unit for tabulation, the first in the nation to do so. Monongalia is also the second county in the state to purchase ExpressPoll® Electronic Pollbook tablets for countywide use on Election Day. Monongalia County is a technological leader in the state, furthering that reputation with this election equipment purchase. Monongalia will purchase 280 ExpressVote units, 60 DS200 tabulators and 120 ExpressPoll tablets. They are the first county in the nation to have 100% of their voters solely vote with an ExpressVote and DS200. Monongalia is the first county in West Virginia to purchase the ES&S ExpressVote and DS200 in-precinct voting system configuration. Monongalia follows Jackson County in purchasing ExpressPoll tablets for countywide use to check-in voters on Election Day. This technology will also allow them to manage poll places and voter information more seamlessly. Mac Besson, Regional Sales Manager for ES&S, stated, “This is a wonderful opportunity for ES&S and the state of West Virginia. Monongalia has selected a platform that can grow with their county for years to come.” Blaney also added “I have been fortunate in my capacity as an Election Official to have worked with ES&S for the last eight years and at every turn their support is first rate,” When asked about any nervousness she had in implementing an entirely new system before a big election cycle. The ExpressVote and DS200 in-precinct voting system configuration is the most widely used in Vote Centers and on Election Day. It will make its official West Virginia debut during Monongalia’s May 2016 election. This equipment is part of the federally certified EVS 5.2.0.0 election management solution. To learn more about the full ES&S suite of voting solutions, please visit http://www.essvote.com/products. ABOUT ES&S: Election Systems and Software, LLC (ES&S) is the world’s largest elections-only company, providing election equipment and services for nearly 35 years. ES&S serves 42 states and more than 2,400 of the 3,144 county-level governments across the United States. Learn more about ES&S at http://www.essvote.com and on Facebook at facebook.com/essvote.